There has been a picture circulating online that allegedly depicts the effects of Lice on Lash Extensions. It was brought to my attention by one of our loyal clients. We educate our clients, and she already knew, just how false and misleading the picture is. She wanted us to publicly address, debunk and put this rumor to rest! 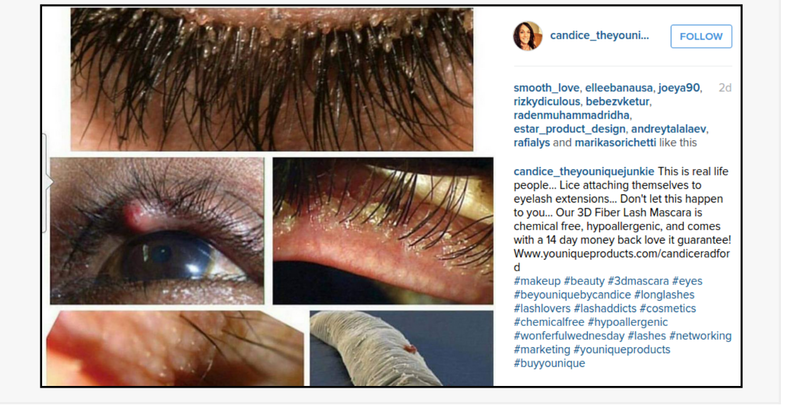 This Rumor began with someone selling 3D Fiber Lash Mascara, trying to market their product, by slamming our profession. We have nothing against using ANY kind of mascara, but as for ourselves and our clients, we wear Lash Extension... that are thoroughly cleaned daily! They are applied with microfiber tip brushes that remove the smallest particles BEFORE they are applied! No one at home is doing that before applying mascara. And you barely can get it off after. Let's debunk this one! Lice can spread on eyelashes or ANY hair on the body.The rare condition is known as pediculosis ciliari. THERE HAVE BEEN NO REPORTED CASES OF PEDICULOSIS CILIARI RELATED TO WEARING EYELASH EXTENSIONS...EVER! Oh, and about the pictures above, NONE of those people are wearing eyelash extensions. If you look up the origin of the pictures on Google, you'll also find that the are not related to lash extensions or Pediculosis Ciliari. You all know that one picture is a stye.